Download a summary of Healthy Building Network’s guidance across the main 7 product categories on HomeFree. This is a good resource to share across project teams as a supplement to more detailed information found on the HomeFree site. 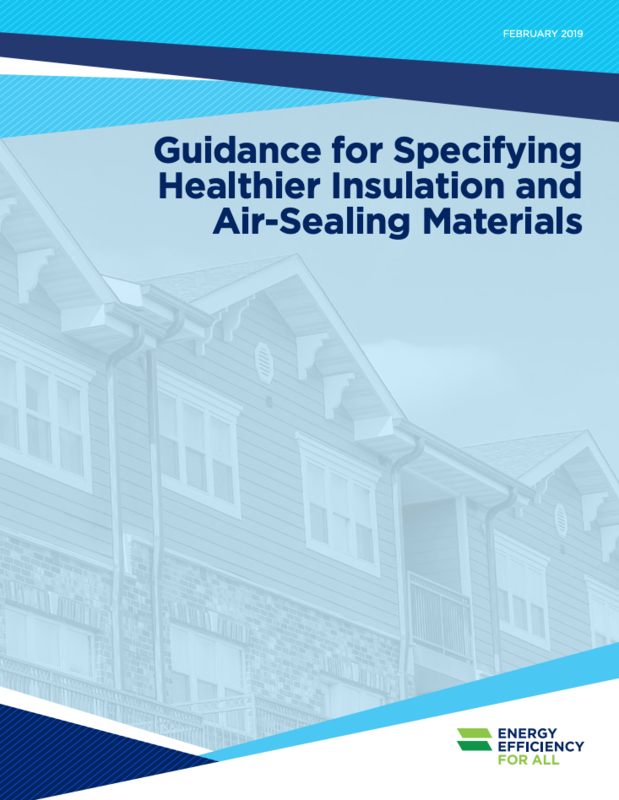 This document provides guidance for evaluating and selecting healthier insulation and air-sealing materials and for incorporating these choices into specifications for energy efficiency upgrade projects. Guidance is provided in multiple formats including summary guidance on healthier insulation and air-sealing materials, tiered recommendations by product category, and sample specification language. See the full report, Making Affordable Multifamily Housing More Energy Efficient: A Guide to Healthier Upgrade Materials, below for information about why it is important to be aware of the use of hazardous chemicals in building products, references to the scientific literature on health impacts of building upgrades and materials, the methodology behind our recommendations, and detailed research into the common content of various insulation and air-sealing materials. Insulation and air sealing are two of the most common interventions performed in energy efficiency upgrades, and yet they can introduce many chemicals of concern into buildings. That’s why Healthy Building Network (HBN) teamed up with Energy Efficiency for All (EEFA) and other partner organizations to consider healthier insulation and air sealing materials and how to help encourage their use in multifamily energy efficiency upgrades. This report includes details of HBN’s research on the common chemical content of a range of insulation and sealant materials as well as simple, actionable recommendations to make the best material choices possible. Because hazardous content is not the only consideration when making material choices, also included is HBN’s compilation of relative cost information, performance characteristics, and installation and code considerations. 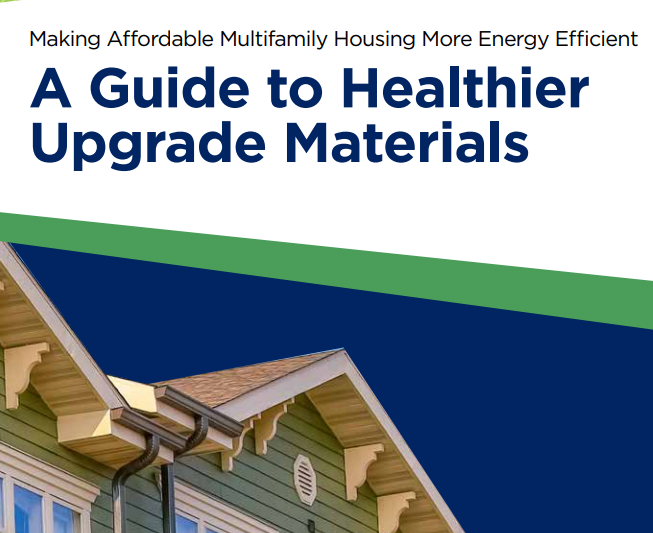 Finally, the report introduces a discussion of policies that may impact material decisions and how to encourage the use of healthier materials in multifamily energy efficiency upgrades. Healthy Building Network's report on post-consumer carpet feedstocks calls for eliminating over 40 highly toxic chemicals in carpets that threaten public health and impede recycling. These toxics are known to cause respiratory disease, heart attacks, cancer, and asthma, and impair children's developmental health. 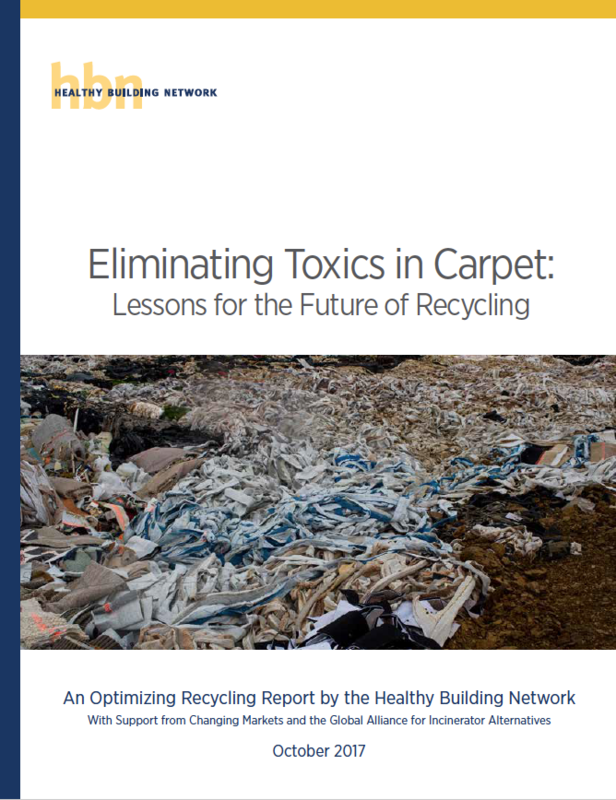 The report outlines strategies to protect public health and the environment by improving product transparency, eliminating dangerous chemicals from carpets, and increasing carpet recycling rates. It also reveals surprising efforts in the industry to remove many of these toxic substances from carpet design. Currently over one third of the polyethylene bottles and bags collected from the waste stream become new building materials. 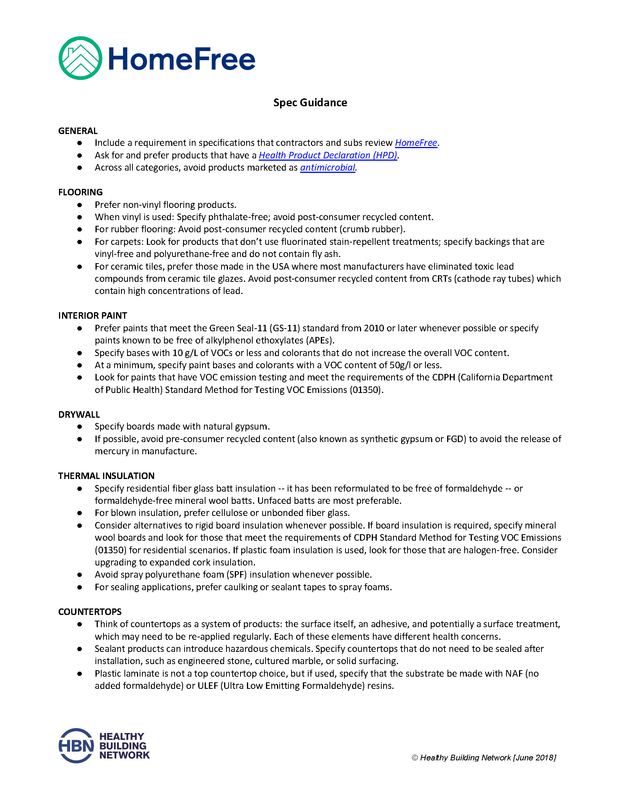 This report presents a set of recommendations to ensure that polyethylene feedstocks meet performance requirements and are screened for toxic contaminants, so that future building products - drainage pipes, plastic lumber, impact resistant walls, substrates, and table tops- are also free of these contaminants. 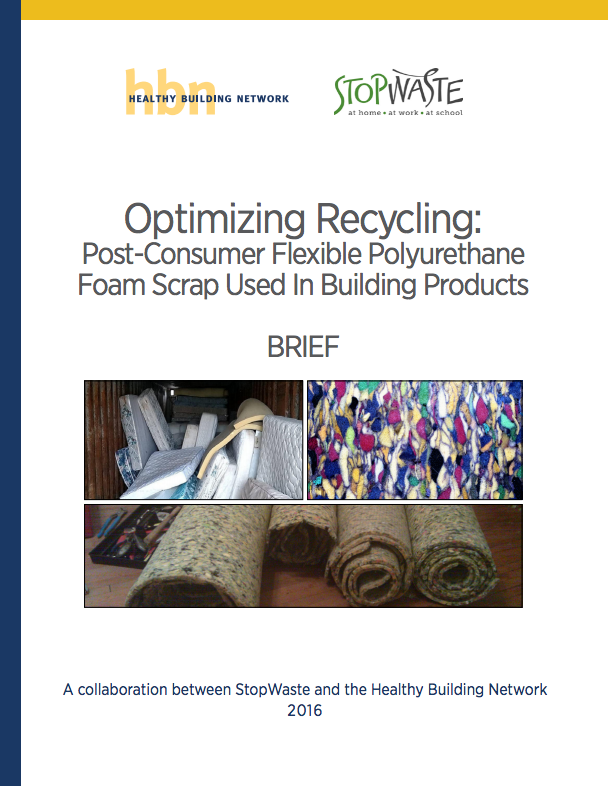 A Briefing of a longer report that looks at the post-consumer supply chain of flexible polyurethane foam from its beginnings as scrap from furniture manufacture, into carpet padding that can itself be re-processed into new carpet padding. Until recently, carpet pads were made in large part from foam used in furniture that was treated with toxic flame retardants in order to meet fire safety standards. The use of flame retardants in new furniture foam has been largely phased out in the US, however old carpet pads that can contain high levels of flame retardants are still being re-processed into new carpet pads. This paper was prepared by Perkins+Will, in partnership with Healthy Building Network (HBN), as part of a larger effort to promote health in the built environment. Indoor environments commonly have higher levels of pollutants, and architects and designers may frequently have the opportunity to help reduce or mitigate exposures. 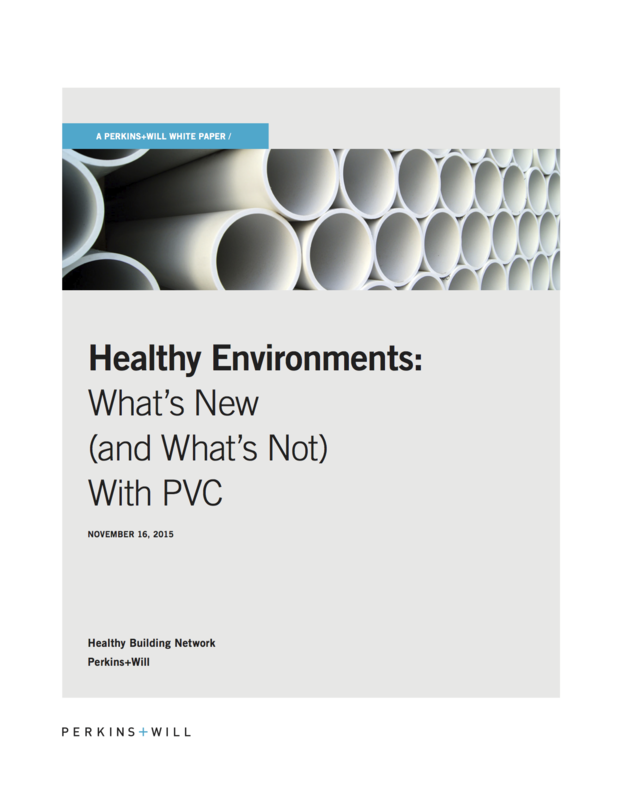 The purpose of this report is to present information on the environmental and health hazards of PVC, with an emphasis on information found in government sources. This report is not intended to be a comprehensive analysis of all aspects of the PVC lifecycle, or a comprehensive comparative analysis of polymer lifecycles. Rather, in light of recent claims that PVC formulas have been improved by reducing certain toxic additives, this paper reviews contemporary research and data to determine if hazards are still associated with the lifecycle of PVC. This research has been surveyed from a perspective consistent with the precautionary principle, which, as applied, means that where there is some evidence of environmental or human health impact of PVC that reasonable alternatives should be used where possible. Furthermore, and more generally, this paper is intended to build greater awareness of this common building material. The recycling industry has made significant strides toward a closed loop material system in which the materials that make up new products today will become the raw material used to manufacture products in the future. However, contamination in some sources of recycled content raw material (“feedstock”) contain potentially toxic substances that can devalue feedstocks, impede growth of recycling markets, and harm human and environmental health. 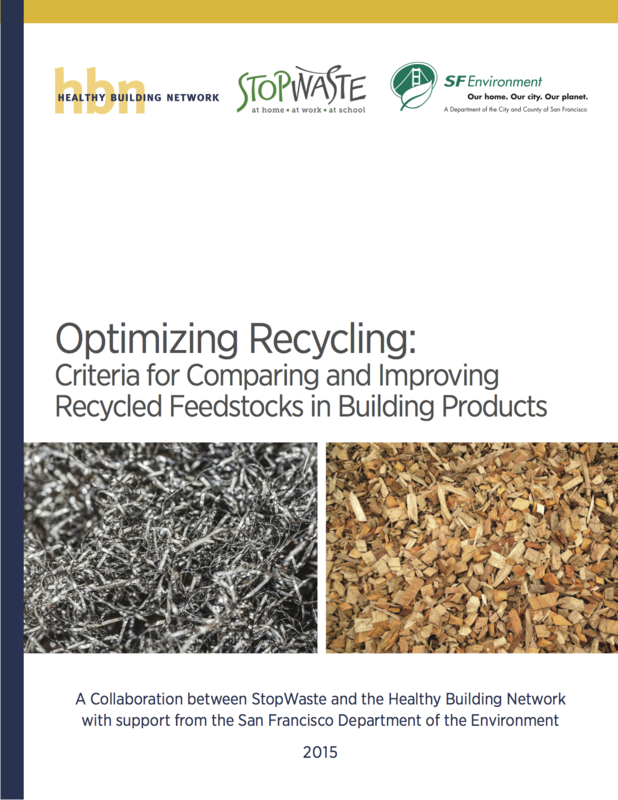 Since May 2014, the Healthy Building Network, in collaboration with StopWaste and the San Francisco Department of Environment, has been evaluating 11 common post-consumer recycled-content feedstocks used in the manufacturing of building products. 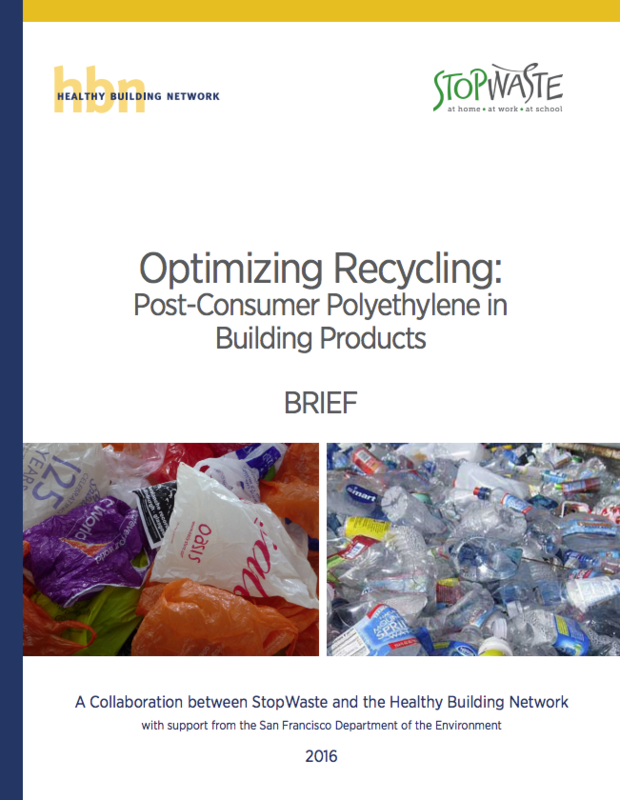 This paper is a distillation of that larger effort, and provides analysis on two major feedstocks found in building products: recycled PVC and glass cullet. This research partnership seeks to provide manufacturers, purchasers, government agencies, and the recycling industry with recommendations for optimizing the use of recycled content feedstocks in building products in order to increase their value, marketability and safety. 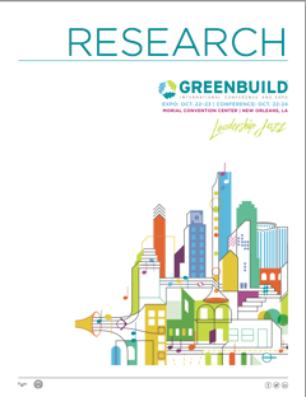 This report was prepared in support of a research session at the 2015 Greenbuild conference in Washington, DC. Asthma is a complex, heterogeneous disease, often of multifactorial origin. The Centers for Disease Control (CDC) reported that the number of people diagnosed with asthma grew by 4.3 million during the last decade. Nearly 26 million people are affected by chronic asthma, including over eight million children. Among asthma risk factors, health organizations have identified hundreds of substances that can cause the onset of asthma. Many of these asthmagens are common ingredients of building products like insulation, paints, adhesives, wall panels and floors. This paper identifies asthmagens found in building products, how people can be exposed to these substances, and what is known and yet-to-be known about the impacts of these exposures. 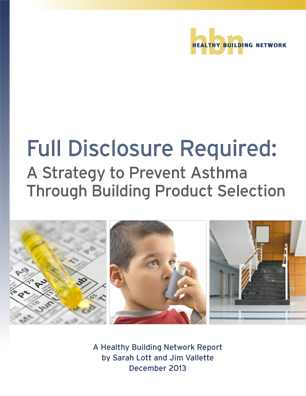 Asthma rates in the United States have been rising since at least 1980. Today, nearly 26 million people are affected by chronic asthma, including over eight million children. These rates are rising despite the proliferation of asthma control strategies, including indoor air quality pro- grams. The Centers for Disease Control (CDC) reported that the number of people diagnosed with asthma grew by 4.3 million during the last decade from 2001 to 2009. As asthma affects more people, it becomes increasingly clear that new strategies need to be considered, focusing on the prevention of asthma onset. Few strategies are in place that effectively prevents exposure to chemi- cals that cause asthma. Due to the complexity of this condition conventional efforts have largely focused on asthma management. Health organizations have identified a number of chemicals that are known to cause the onset of asthma, and are therefore labeled asthmagens. Since these chemicals are common ingredients of many interior finishes, like floors, carpets, and paints, it is possible to improve asthma prevention strategies by reducing or eliminating these chemicals from building materials. 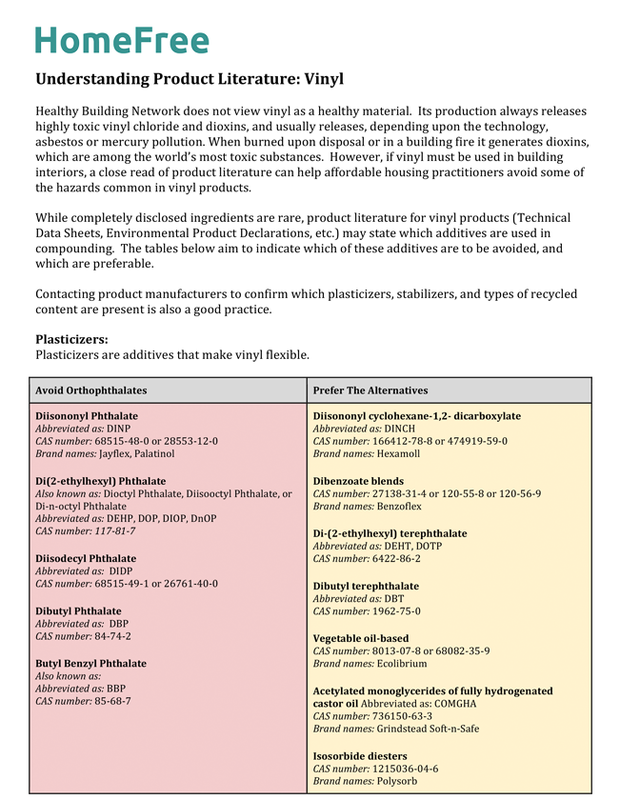 The Healthy Building Network (HBN) took a three-pronged approach that examined how pervasive asthmagen chemicals are in the built environment, what steps have been taken to address them, and what further actions are needed.